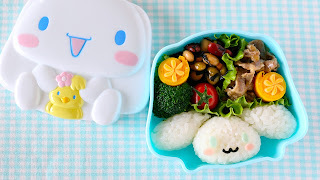 This video will show you how to make Cinnamoroll Bento (Lunch Box). I used this Sanrio Characters Bento Book as a reference! 3. Cut the egg into 2/3-inch pieces. Cut out the sliced cheddar cheese into small oval shapes. Then cut them diagonally. Attach them with bits of mayonnaise to look like orange pulp. 2. Put steamed rice in a bowl and mix a pinch of salt to taste. Use plastic wrap and form the rice to make the face and the ears of cinnamon. Cut out the blue sheet of egg to make cinnamon's eyes. Cut out a slice of ham to make cinnamon's cheeks. ‪Use Nori Punch to cut out the mouth (you can also use scissors)‬. Then attach them with bits of honey with tweezers.